The story is basic enough, Sandy Patterson (Jason Bateman) is the victim of identity theft. Of course, he learns this at the worst possible time, just as he's beginning a new company with some co-workers after being fed up with the political b.s. they deal with on a daily basis at the large financial firm they are employed at. Funny thing how poor financial standing doesn't look so great to one's employer when working in the financial industry. The police aren't much help in this case either, saying that the culprit would virtually have to be standing in front of them before they could do anything because the questionable purchases were not made in their jurisdiction. Sandy lives in Denver. Diana, the identity thief (Melissa McCarthy) resides and operates in Florida. Sandy ventures off to try to apprehend the thief and bring them back to Denver so that he can get his life back in order. 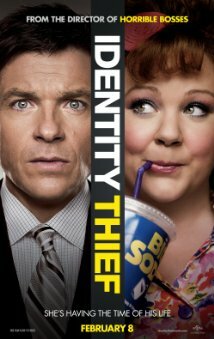 I'm a fan of both Jason Bateman and Melissa McCarthy, so despite the basic (and at times more complex than necessary) story, I enjoyed Identity Thief quite a bit. As I mentioned, most of the funny parts are in the trailer, but there are also a few that are not, which makes it worth while. There are also small supporting parts from Amanda Peet, Jon Favreau, T.I., John Cho, and the T2000 himself, Robert Patrick. T.I. and Patrick are both part of a subplot that I personally don't feel was all that necessary. It added an 'on the run' element to the story that was clearly there only to make the trip back to Denver that much more difficult. It did force Bateman and McCarthy into an odd, almost 'buddy cop' relationship that does make the end of the film interesting, although I feel like that could have still been achieved without playing up the 'on the run' plot line quite so much. Anyway, Identity Thief isn't a blockbuster comedy, but does provide a number of laughs. If you're a fan of either Bateman or McCarthy then you will most likely find it worthy of your time. Amanda Peet Identity Thief Jason Bateman John Cho Jon Favreau Melissa McCarthy movies Robert Patrick T.I.